Christine Lagarde will be under the microscope at the International Monetary Fund’s annual meeting in Washington on September 23–25. The silver-haired woman the French like to call “the American” will push ahead with reforms giving emerging markets greater say at the international lender. In campaigning for the job, her first stop was Brazil. China, which also supported her candidacy, seems likely to get a top deputy’s slot. Barely a month into her new role as IMF managing director, Lagarde faced an investigation by a French court in August for alleged abuse of her authority as French finance minister. She is accused of pressuring then-state-owned Credit Lyonnais to enter binding arbitration in a dispute with businessman Bernard Tapie, who supported President Nicolas Sarkozy’s election campaign. 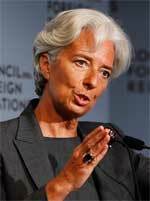 Lagarde’s IMF contract includes a clause saying that she must avoid even the appearance of impropriety. The IMF executive board says it was aware of the case before Lagarde’s selection to head the institution and is confident that she will be able to effectively carry out her duties. An attorney and former chairman of international law firm Baker & McKenzie, Lagarde speaks fluent English and possesses considerable negotiating skills. Her first challenge will be the sovereign debt crisis that is spreading beyond the periphery of the eurozone. She can call on her experience brokering the first Greek bailout. At some point, she may have to drop her opposition to a Greek debt restructuring and focus on managing an orderly default. Lagarde says she wants the IMF to be relevant, credible and effective, but she will need to find a way to reduce imbalances in the global economy. One idea she may champion is a so-called Tobin tax on foreign exchange transactions. She says this could raise the $100 billion a year pledged to help developing countries, starting in 2020, deal with the effects of climate change.